This year I joined Caroline at Beauty is a Sleeping Cat in her journey around the world via film. Her World Cinema Series is a simple, but exciting adventure. The goal is to watch a film from every country. For my first stop I visited Spain. The movie Cell 211 was about a prison riot. Ironically, my next film is also about criminals. 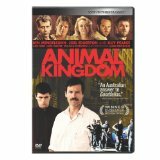 Animal Kingdom is an Australian crime drama. I’m not sure what this says about my personality that both of the movies so far are about criminals. David Michod wrote and directed this flick and it is based on the Pettingill family of Melbourne, Australia. The real life criminal family was headed by Kath Pettingill, who started out as a prostitute. They were involved with arms dealing, armed robberies, and drug trafficking. Her six children were well-known criminals in Australia. The opening scenes of the movie introduce Joshua ‘J’ Cody (James Frecheville), a 17-year-old. His mother has just died from an overdose of heroin. He doesn’t know what to do so he calls his grandmother, Janine ‘Smurf’ Cody (Jacki Weaver). J’s mother was estranged from her mother so J hadn’t seen his grandmother much. His grandmother invites him to move in with her and he readily agrees. Smurf has three grown sons. The eldest son, Andrew ‘Pope’ (Ben Mendelson) is unstable and is hiding from the police. Craig (Sullivan Stapleton) is a drug dealer. The youngest son, Darren (Luke Ford), does not have a backbone and does what he is told. Pope meets one of his friends and cohorts, Barry ‘Baz’ Brown (Joel Edgerton), at a shopping center. Baz tells Pope that he is tired of his life of crime and wants to go clean. When Baz gets in his car to leave, he is approached by the police and is killed. Pope wants to revenge his friend’s death and decides to kill two police officers. He enlists help from his brothers and asks J to steal a car for them to use. The police start to question the brothers and J about the murders. The family starts to question J’s loyalty. They don’t know him that well and he is really young. Can he handle the heat without ratting out the family? What will the family do? And what will J do to survive? And the police killed Baz, can J trust them? Even though this movie is a crime drama, the action is slow. The tension builds slowly. At first I wasn’t sure I liked the film. However, as the plot unfolded I found myself getting more and more involved. Soon, I was on the edge of my seat. It’s a disconcerting film. The twists and turns hooked me completely. I would never want to associate with this family. The title suggests that J is living in the wild. The laws of the wild prevail: kill or be killed. If you would like to see other reviews from around the world, please visit this page. This entry was posted in Movies and tagged Animal Kingdom, Ben Mendelson, Crime Families, David Michod, Foreign Films, Jacki Weaver, James Frecheville, Joel Edgerton, Kath Pettingill, Luke Ford, Movie Reviews, Pettingill family, Sullivan Stapleton, World Cinema Series. Bookmark the permalink. Guy has reviewed the book about this family not too long ago. I’m not sure he mentioned the movie but I think so. It sounded rough. A whole family of criminals and led by the mother. I think I’d llike to watch this, it sounds captivating. I didn’t know there was a book on the family. I’ll have to pick it up. Seriously this family scared me. I can’t imagine growing up in a crime family. Captivating is a good word for it. Just remember it starts off a little slow, but it is quietly intense. The movie sounds so intense. But it kinda reminds me of Godfather…in a way that it is about family and criminality. Thanks! When a friend recommended this film to me, she said, it isn’t about animals and it isn’t a Disney movie. She was right. Yes it is like the Godfather. Thanks for that comparison. Going to have to check out this movie!! It sounds really intriguing!!! Off to Netflix I go to see if it is on there!!! Great review! I hope Netflix has it for you. It is a chilling movie! Some families are crazy! Intriguing. Thanks for the summary. The family was odd, but the suspense kept me in the movie. You can join the fun. If you want, and if you can find the time after the kiddies go to bed, check out the link above. Anyone can add the movies they’ve watched. I haven’t seen A Separation, but I’ll add it to my rental list. You don’t have to commit to a certain number of movies. But I understand the time commitment issues. So you are also welcome to follow the progress. Really good review, I need to watch this film after reading what you have wrote. I enjoyed it. I expected something different but was not let down. Thanks for replying, you should check out my reviews if you get the chance.